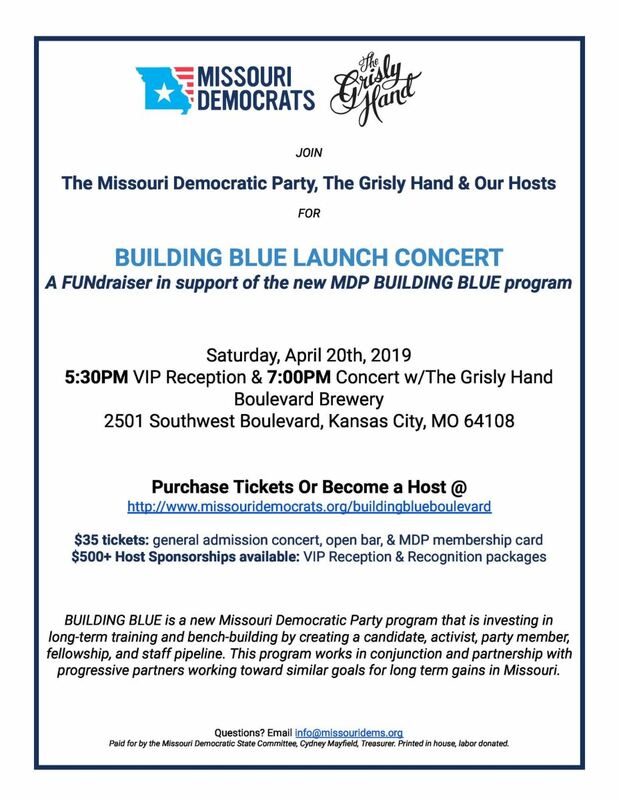 Mark your calendars for June 1 as Jackson County Democrats, honored guests and supporters from around the region return to Arrowhead Stadium for the biggest paid gathering of Democrats in Missouri. Things are fluid right now but we are happy to announce a major format change. Instead of the regular awards and keynote speaker event, we will be hosting a panel discussion about the state of the party and how to win in 2020 featuring a number of candidates for President. Names will be announced in the coming weeks but you can reserve your seat now. Don't miss out on this special event. Purchase tickets HERE or contact Geoff with questions or if you would like to become a sponsor. See you June 1st at Arrowhead! The House of Representatives on April 2 voted 98-42 to grant preliminary approval to legislation that would allow anyone to carry a concealed firearm on college campuses. Under existing law, campus conceal-carry is prohibited except for individuals to whom a school’s governing body has given permission to carry. House Bill 575 originally was limited to allowing university governing boards to designate certain faculty members or staff as “campus protection officers” who, even though they aren’t trained law enforcement officers, would be granted the same legal authority as police to make arrests or use deadly force. The bill, which Democrats unanimously opposed, was amended during debate to add the provision legalizing carrying concealed weapons on campus. HB 575 requires a second vote to advance to the Senate. The Missouri Department of Revenue violated state law in January when it changed the formula for calculating paycheck withholdings without going through the required regulatory process and public disclosure, according to an audit of the department released April 2 by State Auditor Nicole Galloway, a Democrat. In addition, the audit found that the secretly adopted withholdings formula is resulting in more money being taken out of Missourians’ paychecks than necessary, although this won’t affect their overall taxes owed for the year. Because of the change, an additional $62.9 million is coming out of the paychecks of Missourians with adjusted gross incomes of less than $125,000, or about 53 percent of all taxpayers. The department has faced bipartisan criticism for months for failing to warn Missourians that changes in federal tax law championed by the Trump administration had resulted in too little money being withheld from their paychecks during 2018, leading to surprise tax bills for many Missourians. With the secret January change, it appears the department attempted to swing the pendulum in the other direction, perhaps to shore up flagging revenue collections during the final half of the state fiscal year, which ends June 30. In its official response to the audit, the department said it will take steps to comply with the appropriate regulations. During repeated testimony before legislative committees this year, former department Director Joel Walters never mentioned the January change in withholdings. Walters announced his resignation on March 15, just days after Republican Gov. Mike Parson’s administration received a preliminary copy of Galloway’s audit. 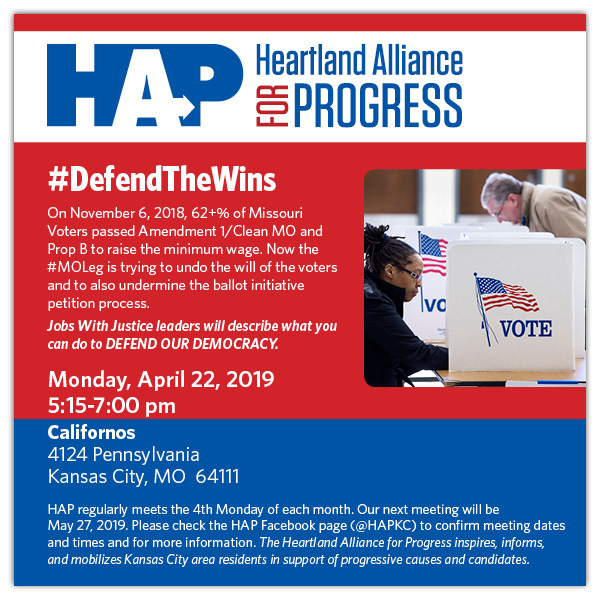 Heartland Alliance for Progress: Monthly meeting, Monday April 22nd, 5:15pm at Californos (4124 Pennsylvania in Westport). 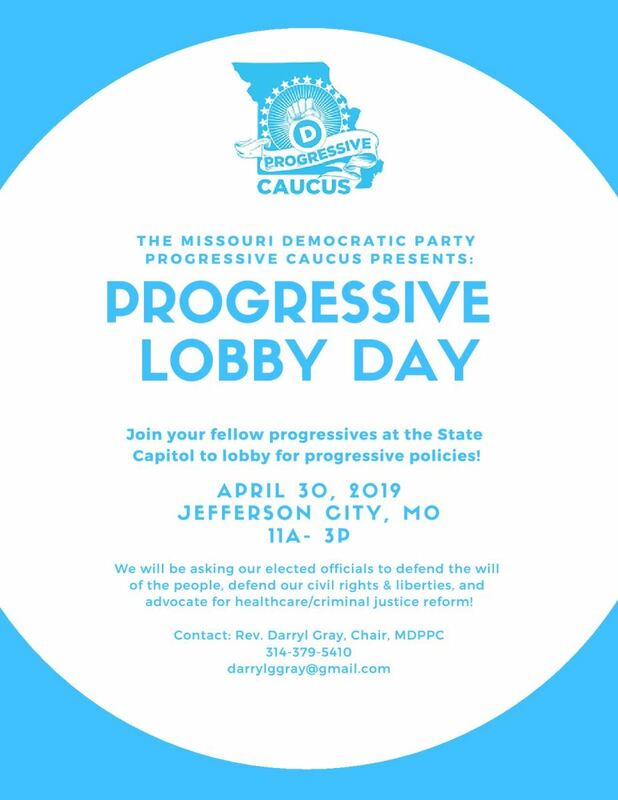 Learn how you can help prevent the Missouri Legislature from undoing the will of the people after the 2018 elections. Missouri State Party: 2nd quarter regular meeting. 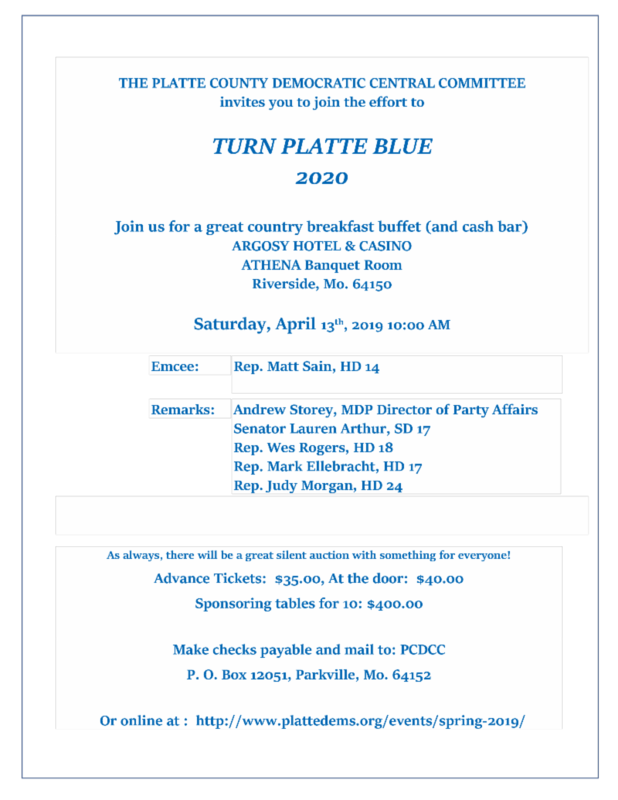 Saturday, April 27 at Lincoln University Scruggs University Center, Jefferson City. Additional details released when received. Jackson County Democratic Committee: 2nd quarter regular meeting. 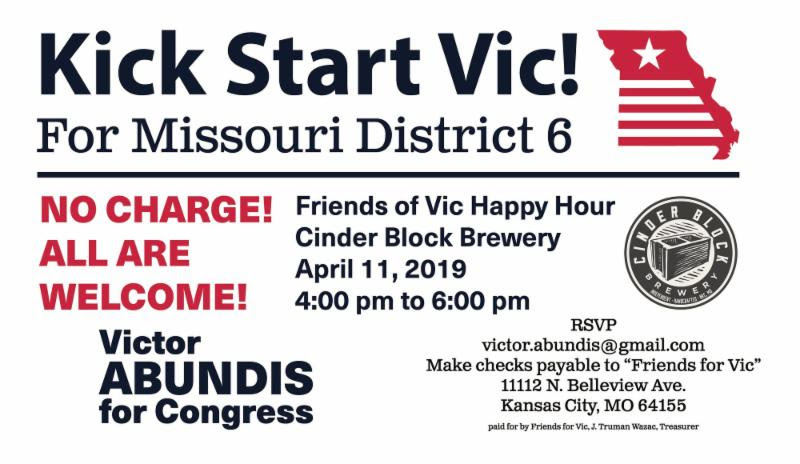 Thursday May 9th at the Downtown KC Courthouse, 415 E 12th St. KCMO. Meeting begins at 7pm. Agenda TBD.